(This article originally published 27 Sep 2013. See also: 'Iceland proved there is a way of dealing with financial crisis in isolated country' of 27 Apr (includes embedded broadcast) and Iceland President accuses England, Holland of financial bullying of 1 Feb 2010 on YouTube.) As Iceland’s banking system went into meltdown at the start of the global financial crisis, it came under enormous pressure from the rest of Europe to accept crippling austerity measures that would have burdened its people for generations to come. And yet the tiny island nation stood up to the European Goliath, defiantly opting for democracy even as it stood on the brink of bankruptcy. 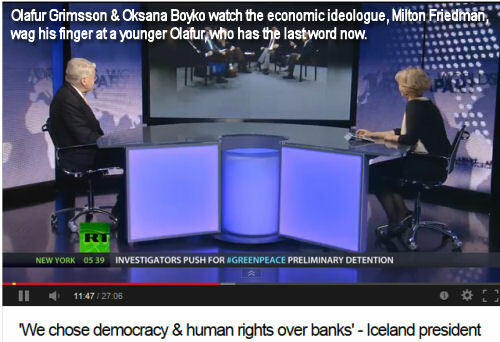 What can Iceland teach the world about the power of the people and the rule of law? To discuss these issues, Oksana Boyko, powerful Worlds Apart journalist, is joined by the President of Iceland, Olafur Grimsson. The video inside includes a hilariously black piece of humour in footage of Milton Friedman telling a much younger Olafur Grimsson that his values could only lead to tyranny. Olafur Grimsson argues in retrospect that Friedman led the tyranny of the market which is currently impoverishing the states that do not stand up to the international bankers. Some candobetter readers may be familiar with Melanie Klein's book, The Shock Doctrine, which explored a theory of the impact of the Friedman ideology, in the development of 'disaster capitalism'. This Milton Friedman ideology is, by the way, the one that the Australian major political parties, the ALP and the Liberal Party, still follow - with privatisation and the market supreme. As Oksan Boyko says, criticism of economic rationalism in elected political circles is a very unusual proposition for the West. What is more important? Democracy or the interests of the financial markets? Grimsson notes that it is difficult to find a country more peaceful and secure than Iceland, with a democratic history extending back 1000 years, but when the banks collapsed, the country was faced with riots. He points out that the breakdown of the financial system can threaten democracy: Banks and other economic organs carry an enormous democratic responsibility which has been denied in political economies that give the market primacy. Should he just surrender to these threats of austerity or let the people decide? He decided to have a referendum - which went against other European states. There was a very simple truth at the bottom - what is more important? Democracy and the will of the people, or the interests of the financial markets? The answer was obvious. What is Europe's most important contribution to the world? Not its economic system, but democracy. Were other European leaders prepared to sacrifice this one thing that justifies governments. Apparently they were. Oksan Boyko talks about the "tyranny of the [economic] status quo", asking Grimsson whether he thinks the world has really learned the lessons of the [global financial] crisis and has addressed the underlying reasons? Grimsson's answer is very interesting, to do with the experiences of Iceland in its resistance to the IMF's demands, which he says were revealed to be illegal. The high officials of the IMF acknowledged that maybe they had learned more from dealing with the Iceland crisis than they expected. Grimsson also notes that the five Nordic countries in Europe have a combined population of about 20 million and form living experiments that prove that you can have good social welfare but a competitive economy. That you do not have to slash and burn the social fabric as is being done in so many parts of the world. Australia take note; the 5 top democratic economies in Europe have combined a population less than Australia's, but they are more successful and more democratic. The interview covers a lot from a European perspective that values democracy in the light of still vivid memories of the terror of the second world war. Grimsson talks about the responsibility of politicians to listen to their people. He also says that ordinary people have a much clearer sense of what is important than so-called experts. Grimsson also discusses the role of the UN and the need to engage Russia and China. Boyko sums up well that he is simply suggesting that all countries be treated as equal. Watch Iceland’s president explain just how they got their country down to 2% unemployment and kick-started their economy. President Grimsson scrapped the same economic dogma that was imposed upon Australia by former Liberal prime Minister John Howard and, prior to that, the late former NSW Premier Neville Wran after 1996 and Victorian Premier Jeff Kennett in the 1990s. Subsequently, Wran's 'Labor' mates, Bob Carr, Bob Hawke, Paul Keating, Peter Beattie and Anna Bligh imposed more of the same.